This Yucatan cycling holiday in Mexico is a leisurely introduction to this diverse and beautiful region. Straddling the Gulf of Mexico and the Caribbean Sea, and scattered with colonial cities, ancient pyramids, dense jungles and the ruins of Mayan temples, a cycling holiday in Yucatan gets you up closer to the local culture, and leads you around the largely tarmacked backroads to get that bit closer to daily Mexican life. 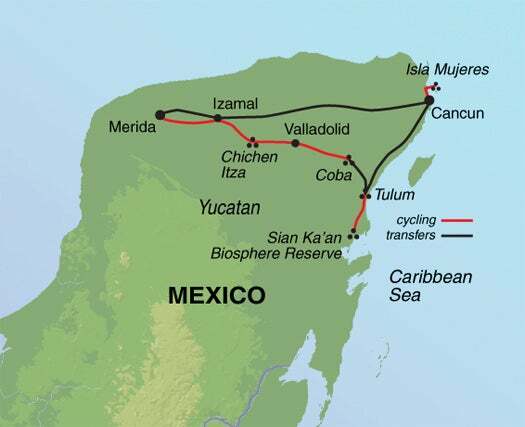 Your Yucatan cycling holiday starts off with a pedal around Isla Mujeres, a tranquil island just off Cancun. You’ll tour colonial Merida, the ‘Yellow City” of Izamal, the impressive site of Chichen Itza – one of the New Seven Wonders of the World – and hang out at the laid back beach community of Tulum. You’ll cycle along the coast to the Sian Kaan Biosphere Reserve – a stunning cluster of ecosystems home to over 300 species of birds. With all that cycling, you’ll be keen to cool off in idyllic cenotes along the way – as well as on the Riviera Maya, where you can snorkel along an immense coral reef. You’ll also have earned your fill of Mexican food – as if you ever need an excuse to tuck in to tacos! Few holidays have as little detrimental impact on the environment and local residents as a cycling trip. Erosion on and adjacent to popular paths is a growing problem in certain places and therefore our trip leaders encourage clients to stick to advised routes in order to minimise this. We do believe in leaving no more than footprints (or tyre tracks!) although this tour actively encourages guests to talk to local people, visit local cafes and restaurants, use markets to purchase traditional gifts and crafts and get a real impression of theMexico. In order to give back to the environment which we enjoy so much, we also support The Coral Reef Alliance, which develops a series of conservation projects and practices involving sea life. Water is a really important issue with cycling trips and whilst we must stay hydrated, it is also vital that we have a system for providing clean water without causing lots of waste with plastic bottles. We suggest that instead of repeatedly buying bottled water, guests should re-fill a singular bottle. We can provide 20 litre containers and advise where to fill them and where to recycle in order to minimise waste. We employ local tour leaders for their insider knowledge and passion for the area and in exchange for this expertise, we provide steady employment, fair wages and fair treatment for all our staff. For over 15 years we have also been working with various Mayan communities, hiring them as guides, captains, boat service providers and hosts. This collaboration on our tours has real benefits for the Mayan people which have proven to improve their economic and educational position. These communities now know the effects of over hunting and fishing on the environment and so this initiative has improved conservation efforts too. Throughout the trip we use carefully sourced, good quality hotels which hire local people and use local suppliers and produce. Where possible, we also select accommodation with environmental policies which match our own ethos e.g. El Rey de Caribe hotel uses solar hot water heaters and clothes driers, strict recycling regulations, composting of garden and kitchen wastes, and capturing of rain water. Where meals are not provided, our guides will be able to recommend the best cafes, markets and restaurants to try. This way we can ensure that smaller businesses benefit, whilst also giving clients the most authentic culinary experiences. One of the best ways to do this is to frequent the street food vendors throughout the trip- try tacos with carnitas or tamales with mole sauce at Izamal town market.